Budget Software house, Mastertronic, are about to launch two new labels, but they’ve nothing to do with computers. Master Vision and Master Sound will produce videos and audio cassettes and LPs respectively. Some of the more notable videos scheduled for release are Felix the Cat, Creepshow and Rock, Rock, Rock. The only cassette CRASH has heard so far is Heat Of Soul, a compilation of classic soul tunes — most of them cropping up in Levi commercials these days. The vids are hoped to retail around the eight pounds mark and the LPs at roughly a fiver. The elaborate Tau Ceti system is once more a backdrop for a an arcade shoot ’em up from CRL. Traxxion, written by Jay Darret, centres around a construction satellite orbiting Reema. However, after the Tau Ceti wars Traxxion was found to be damaged — and as an intergalactic satellite repair-man, your skills are called upon. Arriving on Traxxion reveals a far more serious problem, the reactor has started to meltdown. You have to act quickly and locate the exit from Traxxion’s monorail system before the inevitable destruction. As you may well imagine, the monorail is plagued with hazards such as robotic workers and obstacles that make escape just that little bit more difficult. CRL are hoping for a June release at a yet to be decided price. Although the computer industry isn’t exactly huge behind the Iron Curtain, pirates are running amok producing compilations of Western games and flogging them off at the equivalent of £5. Even stranger is that Raid Over Moscow and the Anti-soviet Rambo appear to be very popular! Whatever next... will little green men want copies of Invaders? High up, an enemy aircraft comes within killing reach in F-15 Strike Eagle. Virgin are releasing their latest Now Games compilation — Now 4. 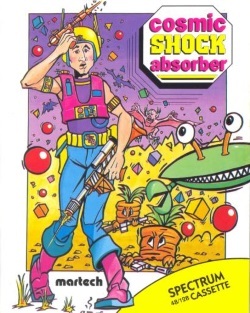 It features Dan Dare, Hacker, Back to the Future, Mission Omega and Jonah Barrington’s Squash. Retailing at £9.95, it’s good value for money with Dan Dare and Mission Omega really taking the cream. 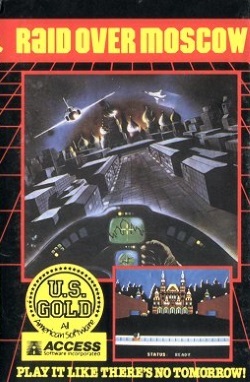 From Microprose, who have recently been let off the US Gold leash, comes Gunship, a strategic helicopter simulation and F-15 Strike Eagle an air combat game. Full reviews next issue. The view from the Gunship cockpit. While Microprose are happily battling away with their F15 flight game, Digital Integration are currently developing a new simulation based on the F16 Fighter Falcon. They’ve been working on some new programming techniques which enable them to increase the density and variety of objects on screen. Missions are planned to include air superiority as well as ground attack sequences. The expected release date is early Autumn, and as ever we’ll bring you a full preview as soon as possible. Remember the old days, when Activision released such classics as Back To The Future, I Of The Mask and Pitfalls One and Two? Well, cue music, cue sound because Firebird Silver have bought the rights to Activision’s back catalogue of games and planning to release nearly forty them the next 12 months. The oldies are going to start sparkling early on the summer. Prism Leisure have just bought up Addictive Games — the company that pushed Kevin Tom’s face into the limelight, and produced the infinitely popular Football Manager. Prism are re-releasing that particular classic at £2.99, although from the amount Prism are crowing about its immense sales figures we can’t help wondering — is there anyone out there who hasn’t already got a copy? Also about to be released on Bubble Bus’ Mini Bus Line at £1.99 is a previous CRASH Smash, Wizard’s Lair. It’s an arcade adventure featuring delightful graphics, and is still recommended by the CRASH team. Finally PSS’ Swords and Sorcery is now on release for a very reasonable £2.99. The next release from Palace is to be a game worked upon by two of today’s most respected programming teams — Binary Vision and Electronic Pencil Company. It’s called Stifflip and Co and follows the fortunes of Sebastion Stifflip and his three intrepid companions in their tropical quest for Count Chameleon. The plot and following action is a spoof on the ripping yarns of the 20’s and 30’s using many of the cliches of the comics and movies of the era. Binary Vision describe Stifflip as a ‘multi-role action packed adventure.’ Preview next ish hopefully, in the meantime we’ll leave you to ogle this screenshot.